The head position is very interesting when it comes to the golf swing. 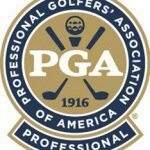 Many golfers, after topping the ball, can be heard saying “I took my eye off the ball, or I looked up.” This is not necessarily so. 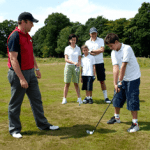 The head plays a very important role in the golf swing although there is no motion. The head is the center of balance, therefore it must stay in position throughout the swing. 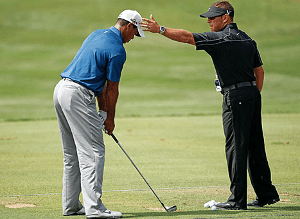 A steady head seems to be a very difficult principle for most golfers to achieve or understand properly. The main reason is tension. Simply stated, you must be free of excessive tension in your body movements. Without having this freedom in your lower body all motions will be too stiff and something will have to give and normally it will be the head. Inactive or stiff leg action will cause the head to move laterally or to lower or raise. With the head moving out of center the body is off balance. Being off balance will create a throwing motion instead of a pulling action. Balance really starts in the address position. If the weight is too much on the toes or the heels the player is sure to lose balance. The weight must be toward or distributed to the inside of the feet, and this is easily accomplished by slightly pinching your knees together during your addressing the ball. A steady head is the solution to balance. The head remains basically in the same position you have established during your setup, and maintains this angle throughout your swing. One of the myths of the golfswing is to “keep your eye on the ball.” I think I have disproven this when I have taught numerous blind golfers over the years. They couldn’t see the ball. I believe that the saying “keep your eye on the ball” was to encourage people to keep your head steady. Golfers over the years have gravely mistaken this statement. A golfer doesn’t mean to look up prematurely. There is another reason we will examine later, and that is the shoulders. The shoulders can move the head so the answer is to learn what the proper shoulder motion should be.